Capturing lithology and structural data by digitizing or using digital photographic images is done in full 3D with attributes of strike and dip. Loacation of Surfaces is obtained from existing survey of crest,toe and bench data or locations from bearings from 3 surveyed targets around the pit. If sub-metre GPS data is available then this could be used as well. Standard digital photographs taken at aproximately normal to the surface to be mapped are "draped" onto the surface and then used in conjunction with "real time" mapping. The resulting "intelligent" data is output as ASCII string files which conform with site legends, string numbers and standards. This process can be applied to walls, benches and faces of any shape/orientation - even curved walls and ramps. 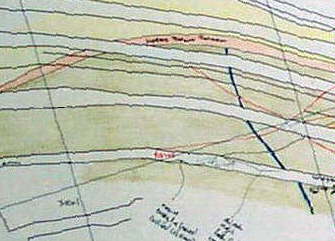 The advantage of digital photographs and mapping is that a record of each surface is retained for future reference, even after it has been mined. the geometry controlling the orebody to assist modelling and interpretation. - generally leads to better resource targeting. 2. A permanent digital record of mapping even after benching, stripping or development extensions mean walls or faces no longer exist. 3. 3D structural data is obtained for analysis and engineering to help minimise dilution, maximise recovery and reduce unit cost. Camera image of hand mapped "Office copy" - OR..
Digital Camera image of pit wall with added notations. Typical output would be as XL compatible tabular data for drilling and sample data - usually as "*.CSV" files. Lithology and structural data as string files with attributes in the descriptor fields - suitable for direct input into the sites mine planning software system. You get real data strings that you can click onto, slice sections through and interrogate for attributes..